Open All Year... 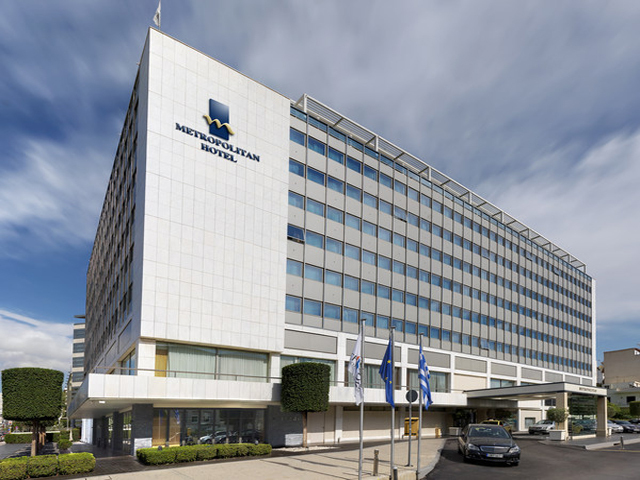 The Metropolitan Hotel has a unique cosmopolitan atmosphere with a combination of luxury, traditional hospitality and modern facilities Guests expect. It has been recently fully renovated and ideally located in the coastal area of the Athens suburbs. THE ACROPOLIS: For thousands of years the Acropolis has been the symbol of Athens, a sacred rock and link connecting the magnificent ancient civilization with today's. The Acropolis, its monuments, its history and the myths connected with it are, rightly, the pride and glory of this City, the envy of all other Cities of the world. There is no Greek or foreign visitor who does not want to make the pilgrimage to the sacred rock and absorb its magnificence and beauty. If you have never been to the Acropolis we can assure you that it is a unique, unforgettable experience. PLAKA: As soon as you start walking around Plaka's stone-paved, narrow streets, you will have the feeling that you are travelling back in time. This is Athens' oldest and, thanks to the restoration efforts, which went into its buildings in recent years, most picturesque neighbourhood. You will be delighted by the beauty of the neo-classical colours of its houses, their architecture, their lovingly tended little Gardens, the elegance and the total atmosphere of the area. In Plaka, even the air is different, lighter, clearer, scented, like a gift from the gods. When you decide to take a walk around it be sure to take a map, because Plaka is a labyrinth and you may get the feeling that you are lost in its maze of narrow streets and alleyways. No need for alarm though. It is easy to orientate yourself: uphill is the Acropolis and downhill are Syntagma and Monastiraki. SOUNION: The temple of Poseidon, standing some 60 metres/200 feet above the sea at the edge of a Cliff on Cape Sounion, is one of the most breathtaking and deeply moving sights in Greece; and Greece has many of them. The temple is an hour's drive from central Athens and both the site itself and the route leading to it are worth every minute of the drive. The road runs along the Saronic coast and from the window of your car or bus you can enjoy the endless and brilliant blue sea. If you are travelling by car make sure you stop for a breath of sea-scented air and a walk on the beach. You will also find many coffee shops, fresh fish Tavernas and ouzeri along the way. PIRAEUS: We are sure that most of you have heard, at least once, the song Ta Paidia tou Pirea / Never on Sunday , which was composed by Manos Hadjidakis and was sung by Melina Merkouri in the film Never on Sunday . But not many people know much about the place that was made world famous by the film and the song, the City and Port of Piraeus. Due to the rapid development of the area between them, Athens and Piraeus have really become one big city, the boundaries between them being more of an administrative nature rather than real ones. The City of Piraeus, planned by the architect Ippodamos from Melos, was built in the middle of the 5th century BC Ippodamos' plans were used as guidelines for replanting the City in 1834. The Metropolitan Hotel has a unique cosmopolitan atmosphere with a combination of luxury, traditional hospitality and modern facilities Guests expect. It has been recently fully renovated and ideally located in the coastal area of the Athens suburbs, 15 minutes drive from the busy City Centre. Le Trocadero is a newly renovated, stylish Restaurant offering authentic Greek and European cuisine to the Guests 24 hours a day. La Veranda Restaurant and Bar in a refined atmosphere with the added charm of Live Music and breathtaking views of the Saronic Gulf where Guests can enjoy their Lunch or Dinner during the summer months. The Atrium Cafe located in the attractive Lobby overlooking a peaceful garden, serves light meals, drinks and snacks. Regatta Bar serves cocktails and drinks with Live Piano Music. Garage located in the Hotel. Tennis Courts 5 km from the Hotel. Free Shuttle Bus from/to Athens Centre. 18 hole Golf Course 10 km from the Hotel. Metropolitan Hotel offers contemporary amenities in a relaxed and friendly atmosphere combined with traditional hospitality and impeccable service. This Hotel consists of 374 elegantly appointed Single & Double Guest Rooms, Superior, Deluxe & Executive, including spacious Suites - Roof Top, Corner & Penthouse Suite. Non Smoking Rooms are also available on request. There are Penthouse Suites of 1, 2 or 3 Bedrooms. The Executive Rooms also have a Trouser Press and Speaker Phones with Double Telephone Line.